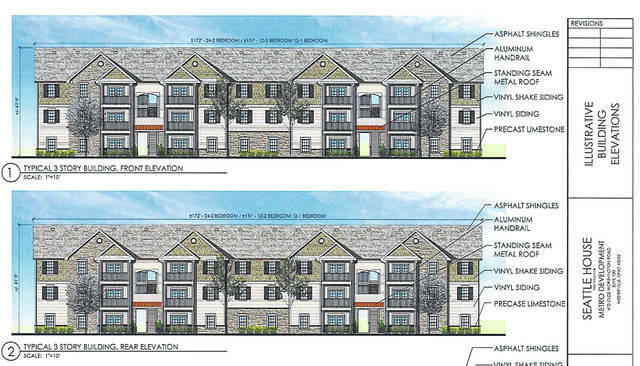 Pictured is an illustration of the front and rear building elevations for the Seattle House Apartments complex as presented to Delaware City Council. Following a fourth reading on Monday, Delaware City Council voted to approve the preliminary development plan for a 240-unit apartment complex, named the Seattle House Apartments, to be constructed on more than 24 acres located north of U.S. Route 36/state Route 37 and south of Bowtown Road on the east side of Delaware. Along with the development plan, council approved a rezoning amendment and a Conditional Use Permit to allow for a Planned Mixed Use Overlay on the parcel of land. Under the development plan, the Seattle House Apartments will be divided into 10 three-story buildings with 60 one-bedroom units and 180 two-bedroom units. Sizes of the units will range from 678 to 933 square feet. Joe Thomas, of Metro Development, stated previously, the yearly income targeted for the apartments would be $40,000 for a one-bedroom apartment and $75,000 for a two-bedroom apartment. The expected cost to rent will range from $900 to $1,200 per month. Amenities in the development include a clubhouse and pool, as well as an outdoor grill. The clubhouse will include 24-hour emergency service, a professional cardio center, a gaming center, and a resident office space that will have desktop computers, printers and scanners. While the preliminary development plan passed, the vote from council was anything but unanimous. Three council members — Chris Jones, Lisa Keller and George Hellinger — voted against the proposed apartments. In previous readings, the three had been vocal about their concerns regarding the proposal. In particular, those concerns stemmed from the proposal failing to meet several of the minimum requirements as stipulated in the R-6 base district code. Among those requirements is a building height no taller than 35 feet, a maximum unit density of 10 units per acre, and minimum sizes of 800 square feet for one bedroom and 950 square feet for two bedrooms. Following the Aug. 27 meeting, a decision was anticipated at the Sept. 10 meeting. However, any potential vote was requested to be delayed by Mayor Carolyn Kay Riggle, who was absent from the meeting. During that meeting, the Metro Development team doubled down on its original proposal, showing renderings of how the development would have to change if forced to build on the land as it was currently zoned. While some council members may not have been on board, both Metro Development and its proposed development had received strong backing from many prominent figures and companies in Delaware’s business community throughout the process, including JEGS Performance and Jim Gill, the owner of Chesrown Chevrolet, Buick and GMC. Attorney Steve Cuckler, speaking on behalf of Metro Development and in response to questions about what the plan would provide to the city, told council at the Aug. 27 meeting that the first benefit the development would add to Delaware would be the connection of US 36/SR 37 north to the development, as well as the extension of Biltmore Drive east to the property line. Cuckler said the road connections would be an almost $1 million expenditure for the developers. In addition to the road connection, he said the apartments will attract young professionals and more jobs to the community, which ultimately means more tax dollars for the city.